After months of waiting Honda has finally announced that its F1 team in Brackley has been sold to Ross Brawn. Honda did not give details of the new ownership structure but it is believed that this involved several other members of the Honda Racing F1 management. As expected the team will have engines from Mercedes-Benz High Performance Engines in Brixworth. The team has also confirmed the anticipated line-up of Jenson Button and Rubens Barrichello, who make the most experienced driver partnership on the grid with 423 Grand Prix starts between the pair. Brawn thanked the team members for their patience and motivation while also adding that support from Mercedes-Benz Motorsport, the FIA (F ©d ©ration Internationale de L'Automobile), FOM (Formula One Management), FOTA (Formula One Teams Association), BERR (the UK's Department for Business, Enterprise and Regulatory Reform) and Bridgestone had been important. "The journey ahead will be challenging but exciting and we know we can count on their continued enthusiasm for our team and its ambitions," he said. 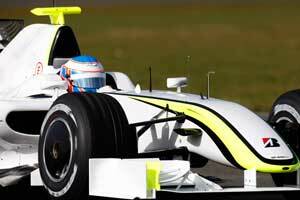 Brawn GP begins testing in Barcelona on March 9 with a second test planned at Jerez bdetween March 15-17.